Globe tomatoes, blanched and peeled --- 4 ea. Kosher salt --- 1 Tbsp. Cut the tops of the tomatoes like a jack o’lantern and save. Remove the centers of tomatoes without puncturing the bottoms; set aside. In a large rondeau over high heat, add olive oil. sauté zucchini, yellow squash, bell pepper and red onion until lightly browned; season with salt, add sun-dried tomatoes, basil, chives and TABASCO® Garlic Sauce and shallots. Stir for 1 minute, then add in heavy cream and reduce by half. Fold in goat cheese until fully incorporated, about 1 to 2 minutes. Allow mixture to cool for 10 minutes and set before placing into tomatoes. 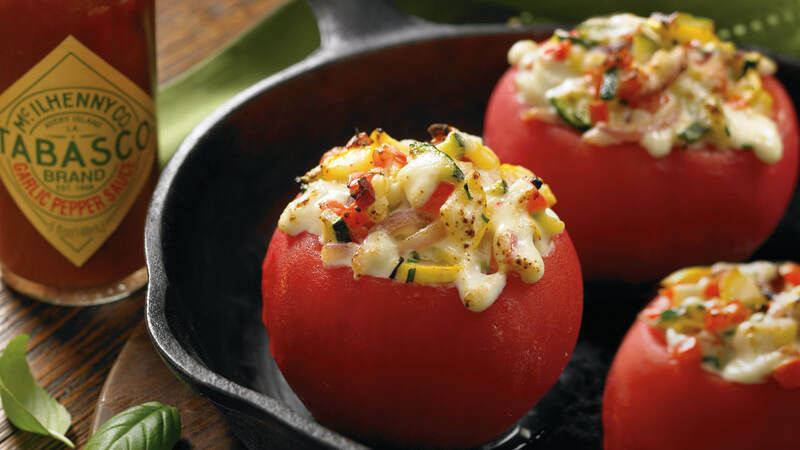 Cover filled tomatoes with tops and place into the preheated oven for 5 to 8 minutes, and serve.